The latest instalment of OKCupid's data-mining blog looks at the thorny question of race again; this time, analysing the text of users' profiles, correlated by self-identified racial group. One part of the article mines keywords unique to racial groups from profiles and presents them as tag clouds, resulting in unsubtle stereotypes. It appears that white people here are not White People; white males are straight-up bros/bogans, into Tom Clancy, sweaty guitar rock, and petrol consumption as recreation, and the females are into spectator sports and a mess of wild-nature clichés, such as thunderstorms, horses and bonfires. (An Irish-American cast looms over both genders, with "Ireland" and plastic-Paddy brocore band Dropkick Murphys rating a mention.) Meanwhile, black people are religiously demonstrative (they're more than twice as likely to mention religion as white or Asian profiles), and Asian and Indian users mention interests in hard-headed professions such as mathematics, engineering and computers, and literature such as Freakonomics, Malcolm Gladwell and Calvin & Hobbes. That and the usual stereotypes. Further down, OKCupid also ran a reading-level analysis algorithm over users' profiles, and correlated it with race and religion. The results were fairly close, though self-identified Indians and Asians had the best-written profiles, with "Latino", "black" and "white" profiles being in the bottom half. 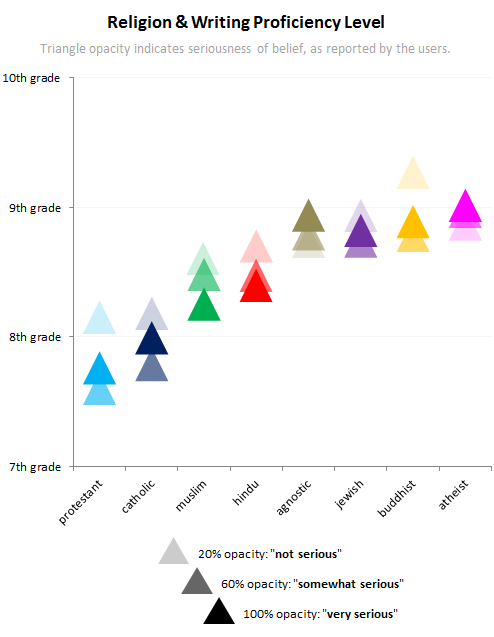 More interestingly, the analysis by religion shows a distinct inverse correlation between religiosity and writing level. Note that for each of the faith-based belief systems I've listed, the people who are the least serious about them write at the highest level. On the other hand, the people who are most serious about not having faith (i.e. the "very serious" agnostics and atheists) score higher than any religious groups. There are no comments yet on "Stuff White People Claim To Like"